In the second installment of the series in 1985 that is First Blood, Trautman offers John Rambo his freedom if Rambo will return to Vietnam to search for American prisoners of war remaining in Vietnamese captivity. Marshall Murdock (Charles Napier), the in charge of the mission, is portrayed in the movie as a corrupt political figure who doesn’t want to expose any kind of truth. Rambo is not to engage the enemy and instead is ordered to take photographs of a North Vietnamese camp, the same camp he himself had been held a prisoner in, to prove to the American public figure there are no more POWs (prisoners of war) in Vietnam. Enraged, Rambo then acts on his own initiative and starts a one-man power and war, hunting the Vietnamese and Soviet soldiers searching for him in the jungle and stealing a Soviet helicopter and destroy them. He flies the helicopter back to the base camp, destroying it and killing the remaining Vietnamese and Soviet soldiers in camp. He frees all the POWs out of captivity and is pursued by a Soviet Mi-24 Hind helicopter. After destroying the Hind with an RPG, he returns to the United States base camp in Thailand with all the POWs. John Rambo then threatens Murdock and tells him to be forthright with the American public regarding the truth of the POWs and to spare no expense in rescuing them all, or else he will return for Murdock. When Trautman says John Rambo will be honored once again. For his actions in Vietnam, John Rambo is granted a presidential award and decides to remain in Thailand. Between the second and third part of the movie, John Rambo takes up a residence near a monastery where he engages in frequent meditation and all to find a sense of inner peace in his body. Although Rambo believes that his soldiering days are apparently over, and he does not become a complete pacifist, as he often participates in violent stick fighting matches and donates his winnings to the people’s to help to renovate the monastery. The film starts with Colonel Samuel Trautman (Richard Crenna) visiting to Thailand for once again help-out John Rambo’s. 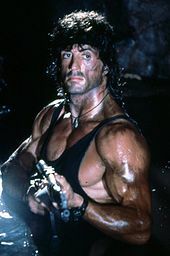 After witnessing John Rambo’s victory in a stick fighting match, Trautman visits the temple Rambo is helping to buildup and asks John Rambo to join him on a mission to Afghanistan. The mission is meant to suppling of a weapons, including a FIM-92 Stinger missiles, to Afghan freedom fighters, the Mujahideen, who are fighting the Soviets. Despite having been shown photos of civilians suffering under the Soviet rule, Rambo refuses to go and Trautman chooses to go on his own. While in Afghanistan, Trautman is imprisoned in a Soviet base camp and tortured for information by commanding officer Zaysen (Marc de Jonge) for many days and his henchman Kourov (Randy Raney). Rambo learns about the incident from embassy field officer Robert Griggs (Kurtwood Smith) and immediately flies to Pakistan where he meets up with Mousa (Sasson Gabai), a weapons supplier who agrees to Rambo to take him to a village deep in the Afghan desert, which is close to the Soviet base camp where Trautman is kept by the Afghan commanding officers. The Mujahideen in the village are already hesitant to help out John Rambo in the first place but are convinced not to help him when their village is attacked by Soviet helicopters by this the Mousa’s shop assistants informed the Russians of John Rambo’s presence. Aided only by Mousa and a young boy named Hamid (Doudi Shoua), Rambo makes his way to the Soviet base camp and he is starts his attempts to free Trautman. The first attempt is unsuccessful and results is Hamid getting shot in the leg, and Rambo himself getting hit by wooden shrapnel. After escaping from the base camp they all go out, Rambo tends to Hamid’s wounds and sends him and Mousa away to safety side. The next day, Rambo returns to the base camp once again, just in time to rescue Trautman from being tortured with a flamethrower. Then after rescuing several other prisoners, John Rambo steals a helicopter and escapes from the base camp. Subsequently, the helicopter crashes and Rambo and Trautman are on their foot. After a confrontation in a base, where Rambo and Trautman both were kill several Russian soldiers including Kourov, Later, they are confronted by an entire army of Russian tanks, headed by Zaysen. Just as they are about to be overwhelmed by the might of the Soviet Army, the Mujahideen warriors, together with Mousa and Hamid, ride onto the battlefield in a cavalry charge. In the ensuing battle, in which both Trautman and Rambo are wounded, Rambo is kill Zaysen by driving a tank into the helicopter in which Zaysen is flying. In the end of the battle both the Rambo and the Trautman say goodbye to their Mujahideen friends, and leave Afghanistan country to go for home. The film starts with footage News of the crisis in Burma. Burma is also known as Myanmar. Former United States soldier John Rambo still lives in Thailand, now he is residing in a village near the Burmese border and captures a living Snakes and selling them in a nearby village. A missionary, Michael Burnett (Paul Schulze), asks a question to Rambo to take him and his associates down the Salween River. Rambo initially refuses but he is convinced by another missionary in the group, Sarah Miller (Julie Benz), and he takes them all. The boat is stopped by pirates who demand “Sarah” in exchange for passages. After taking advantage of the pirates in the last Rambo kills them all. Although his actions result to save the missionaries. Upon the arrival, Michael says that they will travel alone by roadside and will not need Rambo’s help for the return trip. Rambo troubled by Sarah’s potential fate, Rambo decides to accompany the soldiers. After seeing the village is fully destroyed filled with humans and animals, Rambo encourages his team to move on. By hijacking a truck, they create a plan to save the hostages at the P.O.W. camp, doing so within the fifteen minutes of time to avoid alerting the army. Rambo helps Sarah and all others to escape. The Burmese Army unit finds their hostages missing and organizes a massive hunt of man. Everyone except for Rambo, Sarah, and “School Boy”, the mercenary team’s sniper, is captured by them. Just as the group is to be executed, Rambo hijacks a truck which is mounted a 50-caliber machine gun and engages the Burmese army. A group of Karen rebels joins the fight to help out Rambo and the mercenaries defeat the Burmese unit and the battle is lost. Encouraged by Sarah’s lines, Rambo returns to the United States of America. The last scene shows him walking along a rural highway, pass from a horse farm and a mailbox with the name “R. Rambo” on it. After previously stating that he had retired the character, Rambo V was announced in March 2018, with Stallone signed is to write the script as well the star and the hero. The movie is decided to be released in 2019. The plot is decided to include Rambo taking on a Mexican Cartel in order to save a friend’s daughter who is being held hostage by all of them. In May of 2018, Stallone posted an image on Instagram announcing the film, and confirming the intended release date for 2019. By August, Stallone posted an image on his social media, showcasing his training pics for the movie. Later that month, Adrian Grunberg signed as director for the film. Rambo V shooting is set to begin for a shoot in September in London, Bulgaria, and the Canary Islands. In May 2013, Original Entertainment confirmed that they have a five-picture deal with Millennium Films to produce Bollywood remakes of Rambo in this movie the Tiger Shroff will be the leading cast, also The Expendables, 16 Blocks, 88 Minutes, and Brooklyn’s Finest, all the movie with the productions for Rambo and The Expendables movie is expected to start at the end of that year. In early 2017, Siddharth Anand was announced as the director of Rambo and the film will be co-produced by Anand, Daljit DJ Parmar, Samir Gupta, Hunt Lowry, Saurabh Gupta, and Gulzar Inder Chahal. The film will specifically remake of the First Blood and will follow the last member of an elite unit in the Indian Armed forces returning home only to discover a different war waiting for him, forcing Rambo to the jungles and mountains peaks of the Himalayas and unleash the mayhem and destruction. In May 2017, Tiger Shroff was cast in the role of Rambo and the Production Team decided to shoot the film set for 2018 and the Release date is expected on 5th October 2018.